I hope you had a marvelous weekend! My weekend consisted of catching up on a sleep. I slept in past 9:00am on Saturday and Sunday, and it felt so good! Oddly, one of the things I look forward to most on the weekends is running errands with Mr. TBS on Saturday afternoons. It's nice to get outside, not worry about any sort of schedule, and to stop somewhere for lunch (which we always do). We also love catching Sunday matinees at the movies, but there isn't enough quality cinema to make that a weekly occurrence. For the record: I have not read The Hunger Games trilogy or seen the movie. I've heard great things, but they'll have to wait until I can get my hands on a copy at the public library. I went to my first H-town Blogger meet-up yesterday, and it was so great to meet some other blogging gals! I was most excited to meet Fran and Michelle, and they are just as wonderful in person. 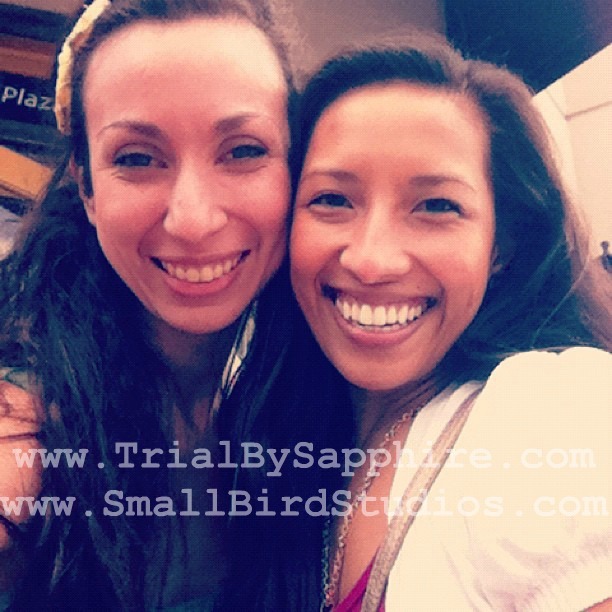 Michelle will be e-mailing photos soon, but here is a gem of Fran and me! Now we're trying to convince our other love, Jamie, to get out here, like, yesterday! H-town gals, it was so great to meet you! See you next month! Mr. TBS and I are moving this weekend, so I'll admit right now that I won't be on top of my blogging and blog reading. Please bear with me! P.S. Moving put me in a really crabby mood tonight. Maybe some wedding stuff will turn that frown up-side-down! We skipped having a full wedding party and only had the Best Man and the Matron of Honor. 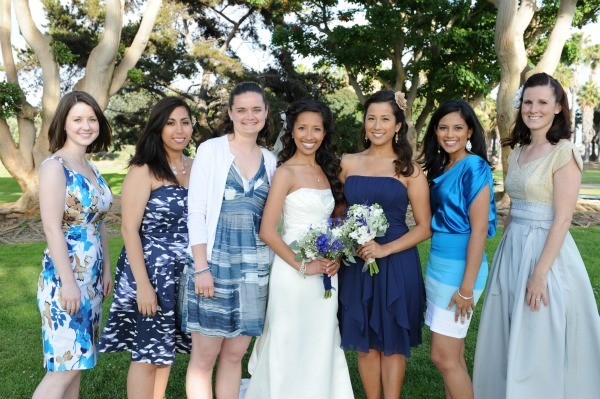 We were short on time, and I didn't feel like I could fully commit to organizing the bridal party details. Also, half of my best friends lived out-of-state, and I felt like it would be that much harder to coordinate. In the end, I couldn't go without recognizing my best friends in a special way, so they were my Something Blue. My only request was, you guessed it, that they wear blue! One of my friends officiated the ceremony! Yup! His family has been in the B&B business in Lake Tahoe and Palm Springs for years. They've hosted intimate weddings at their properties, and my friend is an ordained minister. He offered to officiate the ceremony, and it was so special to have him contribute in that way. We almost went without a photographer. I planned to get photos from my brother (who has a knack for photography) and whoever else took pictures at the wedding. 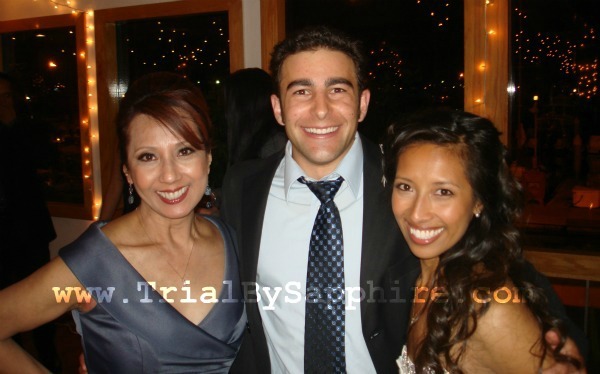 But my sweet parents didn't want him to feel pressured or to miss out on simply experiencing his sister's wedding, so they hired someone... on very short notice! Alon David photographed my uncle's wedding four months earlier, and everyone loved the photos. My dad put in a call, talked out some details, and now we have some amazing photos! I'm very sentimental and always save notes, letters, and cards with wonderful messages. I love reading them years down the line. 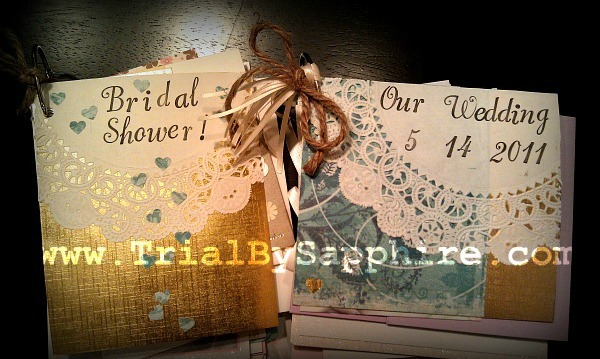 Of course, I wanted to save our wedding cards, and I saw this simple way to bind greeting cards on Pinterest. If you want to see the die-hard version, see the tutorial at Something Turquoise. It's awesome! Yup, that made me feel better! I can't believe it's almost been a year! Where did the time go?! MY GOSH YOU LOOK GOOOOORGEOUS!!!!! You are so stinkin sweet and I am just dying to get out there for real! Ps i never thought in my life I would be dying to go to texas lol who knew?! I hope this week of packing goes quickly for ya! Can't wait til you're closer! So fun!!! Hope you have a great day friend! So good to meet you, Lindsay! Glad you had fun! Good luck moving! And oh, what a sweet idea to have your friends be your 'something blue'! Creative! So excited for your move!!! Sending you all the warm wishes in the world! You better turn that frown upside down...you're smile is too beautiful to not make an appearance every day, giiirl! Just saying :). And I love what you did with the wedding cards - such cute idea, because mine usually end up in boxes...not cute. I've been wondering what to do with all of those cards from the wedding! Now I think I know what to do :) Thanks for the idea! I really wish that I could have made the meetup, but I'm definitely coming next month!! wow! this wedding is so impressive! and you look gorgeous girl!!! cant wait to follow all your adventures!!! So glad you enjoyed the blogger meet-up. I'm totally jealous too, but hey ;) I'll live vicariously through you. Your dad is a smart man for hiring a photographer. I actually think the most important thing, if not top 3, because it shapes how you remember your own wedding, for years to come. Based on the pictures I've seen, he did a great job too! I absolutely love the idea of having "something blue" ladies. What a perfect solution to gather the women who are important to your life, without coordinating bridesmaids.